Tripolis Dialogue has developed a plug-in for WordPress together with their partner Harper Jones, with which it is now possible to create a subscribe form for any client of the Tripolis email marketing software without having to code or implement their own API. The WordPress plugin will allow marketers and IT managers to integrate with WordPress. Adding users to their Tripolis Marketing database without having to do much programming. Below is a the main plugin configuration. 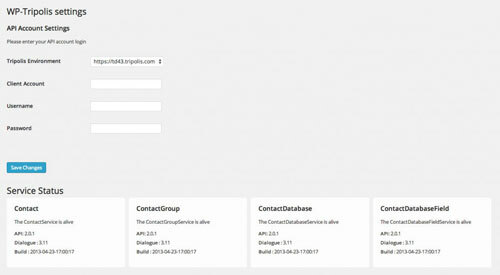 Which allows users to define API login settings and let the WordPress and email marketing software environments talk to each other. Marketers can download and install the plugin in whatever way they are used to and activate the plugin from the WordPress plugins page. After activation a user should have a new Settings page where they need to fill in the API user credentials. Once the setup has been completed it can generate shortcodes, which avid WordPress users are very familiar with. In short you may start using the shortcode. By default this plugin makes it so it is also allowed in the text widget, which should ease the use of the plugin a bit. Marketeers can also directly make a call to the shortcode from their website template. To help create a shortcode, a shortcode generator tool is available via the WordPress admin area under the “Tools” menu. To use the plugin and shortcodes, a user will need to have an active Tripolis Dialogue license and set up an environment by a “Clientdomain Administrator” API user who at the minimum has access to the Contact module and at least one database and workspace. At this moment the plugin has a partial implementation of the Tripolis API (version 2.0), which may be further developed in the next iteration of the WordPress plugin. Joost Nienhuis CEO of Tripolis solutions: “Integrations are critical in a world where customers demand “best in class” solutions to work together as one. This integration is easy to set up and use meaning marketers get the job done faster and more efficient”.